Why do Witches have Cauldrons? Dark Queen » Witchcraft. » Information about witchcraft. » Why do Witches have Cauldrons? Cauldron? This is the next thing on the list of quintessential witchcraft items and the first of the tools in this section of the Defining My Craft blog project. Once upon a time the Cauldron was a technical marvel. In a time where water could only be heated by throwing fire heated rocks into waterproof containers such as pottery bowls or animal hide bags the Cauldron was brought into being through the wonders of metal working. Though born of fire and shaped by the hand of man they were strongly associated with womanhood and particularly with the senior woman of the household and their mundane, and not so mundane tasks. The origins of the physical object lies within metal working and began to emerge in the British Isles with the Bronze Age, remaining the preserve of the higher classes, before spreading in use during the Iorn Age. Even then highly decorated cauldrons were the prized possessions of the ruling elite as evidenced by the ornate and cultural significance of the Gundestrup Cauldron. The word ‘cauldron’ has evolved from the Vulgar Latin caldario and the Classical Latin caldārium which literally means “hot bath”. The word has evolved through the Anglo-Norman word caudron into the Middle English word caudroun that we recognise today. It is interesting to note that thr Anglo-Norman word would have replaced the Old English ċetel (Middle English chetel). These words, from which we derive the word kettle, would have originated from the Old Norse. Both words were used during the same time frame and highlights the language difference between Us (the Anglo-Saxon inhabitants of Britain) and Them (the Norman rulers) as do words like Pig and Pork, Cow and Beef, Sheep and Mutton. The animal in the field is called by the word derived from the Anglo-Saxon origins whilst the meat on the table is referred to by the Norman word. The separation in word origin highlights the separation in estate when it comes to dinner so too in the implements used to prepare it. That’s enough of that diversion. The occult origins of the cauldron in the the prehistoric past, for what could be more magical than the taming of dragonfire and transformation of dull rocks into keen bright metal? Thid means that the Cauldron appears in many mythologies in the Isles of Avalon. Whilst these were recorded during the early medieval periods their origins likely extend back into the Iron Age and beyond, times when cauldrons were the items of authorities belonging to Kings and Goddesses, Giants and their kin. The actions are feminine but in the mythology are performed on/behalf of men, specifically warriors and Kings. This can be interpreted as representating the relationship between the King and the Goddess of the Land. Whilst ever the cauldron worked the relationship was seen as flourishing however should the caudroun fail or be taken that divine mandate was lost and the owner would rapidly fall from grace. Here is a quick look at some of the most prominent examples of magical cauldrons. The Cauldron of Dyrnwch the Giant is one of the Thirteen Treasures of the Island of Britain and was persued by King Arthur himself. It was said to be able to determine whether or not a man was a coward or brave. The cauldron would cook the food of a worthy man in an instant whilst refusing to cook the food of a coward. The story originates from the Welsh tale of Culhwch ac Olwen in which the cauldron is owned by Diwrnach, steward to a Prince of Ireland. Arthur first sent messagers to request that Diwrnach ‘gift’ him the cauldron, visiting Ireland when he was refused to demand it in person. When refused a second time Arthurs champion seizes the cauldron resulting in a war between Arthurs band and the Irish. which Arthur wins (of course). The cauldron is carried back to Britain, stuffed with the spoils of war, to takes it’s place amongst the thirteen treasures. 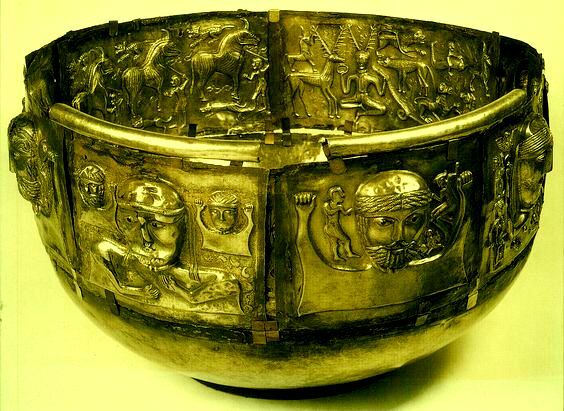 The Cauldron of the Dagda is one of the Four Treasures of the Tuatha Dé Danann Unlike the other treasures, which were talismans of kingly knowledge and weapons, the Cauldron stands out. But only is it a domestic object with strong feminine connections it is linked to the Dagda, the High King of the Tuatha Dé Danann. The Dagda is father-figure and a protector of the tribe and in the warrior cultures the king figure is responsible for the fertility of the land and the welfare of his people, particularly the warriors. One way this was achieved was through the marriage of the king to the Goddess of the Land so it makes sense that one of the Treasures would reflect that aspect of fertility and connection of God King to Goddess. The connection becomes clearer knowing the the power of the Cauldron of Dagda lay not only in healing and resurrecting dead warriors but ensuring that no one went away from it unsatisfied as it overflowed with abundant food. Ceridwen is both Goddess and Enchantress depending on which Welsh medieval legend you read but it all refers to her as possessing the cauldron of poetic inspiration (Awen). 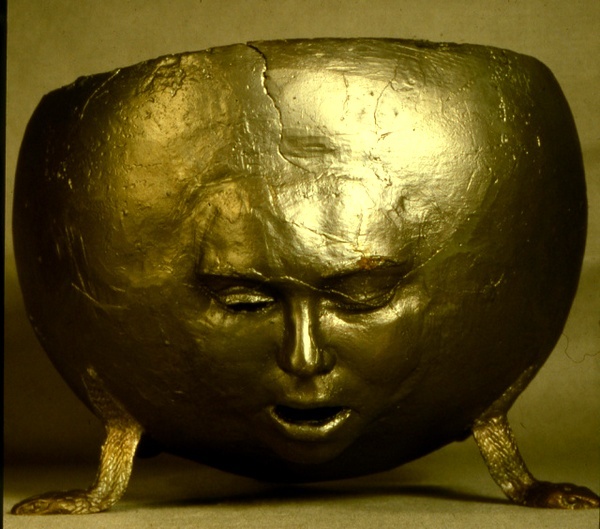 The most famous tale associated with this Cauldron is the Tale of Taliesin. Yhis take recounts her swallowing her servant Gwion Bach, who has consumed three drops of a potion Ceridwen had been preparing for her Son Morfran (also called Afagddu). Gwion was granted all the knowledge of the Awen and was persued by an enraged Ceridwen who, after a battle of shapeshifting, eats Gwion in the form if a gen after he attempts to hide as a grain of corn. The potion is then reborn through her as the bard Taliesin (of the shining brow). Ceridwen originally intended to kill the baby but her will was softened by his beauty and she threw him into the sea where he was found by prince (later king) named Elffin ap Gwyddno; Taliesin grew to become the greatest of bards, the prototype for the magician Merlyn. Pair Dadeni, or The Cauldron of Rebirth, is another Welsh magical cauldron which is able to revive the dead. It plays a key role in the second branch of the Mabinogi where it is used in a cycle of great battles to ensure the success of those who posess it. The cauldron originally belonged to the giant Llasar Llaes Gyfnewid and his wife Cymydei Cymeinfoll, who lived within the Lake of the Cauldron, in Ireland. They were driven from the land by Irish king Matholwch and his court and we’re received by King Bendigeidfran om the Isle of the Mighty. In response to his hospitality, the giants gifted the cauldron to Bendigeidfran. Why Do Witches Have Cauldrons? Cauldrons are sometines cited on the list of primary tools of Witchcraft, more often it appears on the ‘consider it but don’t sweat it’ list. 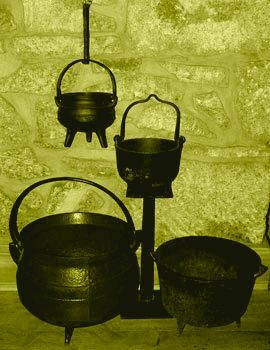 In modern witchcraft cauldrons are mostly tokenistic, that is to say small ceremonial objects rather than large beasts you suspend in the fire to cook up dinner or your magic brew. They have their uses however, and should be seriously considered. Potion making – the mixing of brews can still be done in cauldrons, cold ones at least. If you want to use it over heat check that your cauldron can be used that way. You should also be sure to check that your cauldron is safe to use if you intend to consume your finished potion, some commercial cauldrons are lined with chemicals. Divination – if your cauldron has a dark interior use it to contain water for scrying. You could also use it to contain tools of divination such as runes and other counter based methods. Spell Pot – I will cover spell boxes in a few weeks timebut you could also use your cauldron to house spells as they work for you. Containing Water – I’ve already mentioned scrying and potions however you can use your cauldron in place of a Chalice or Cup to carry water either as a representation of the West or Goddess energies. Containing Fire and Smoke– you can use your cauldron to contain fire as well as water. Burn incense cones or tea lights / votive candles within the cauldron, adding a layer of sand or salt to insulate your work surface. Alternatively your cauldron can become a receptacle of fire itself. It is a fine art so I am told and I recommend this link if you are interested in learning more. 4 Re: Why do Witches have Cauldrons?